MIAMI (AP) — Before and after a hurricane, Ace is the place. And Home Depot and Lowe’s. And many other hardware and building supply outlets. Here’s the thing: the government can only do so much. Most people must fend for themselves at some point, and the local hardware or building supply store is where they go. Not everything is available easily online. Try to buy some drywall that way. “We’re going to be just as busy with clean up once this thing is gone,” he said. Home Depot and Mooresville, North Carolina-based Lowe’s, the two biggest home supply companies, both activated sophisticated emergency command centers that bring together various divisions to work on everything from shipping logistics to ensuring employees in hurricane zones get back on their feet. They have their own meteorologists on duty and are in contact with government agencies. The key is making sure the right supplies are ready at the right time, said Jennifer Thayer, Lowe’s vice president for store operations in North and South Carolina. For example, people might need more gas cans and plywood before a hurricane and more wet/dry vacuum cleaners or tarps for damaged roofs after the storm, she said. Smith said Home Depot has about 1,100 trucks loaded and ready to respond to its stores in the Carolinas and Georgia once Florence passes through. Lowe’s says on its website it has shipped some 2,700 truckloads of supplies to the area threatened by Florence. 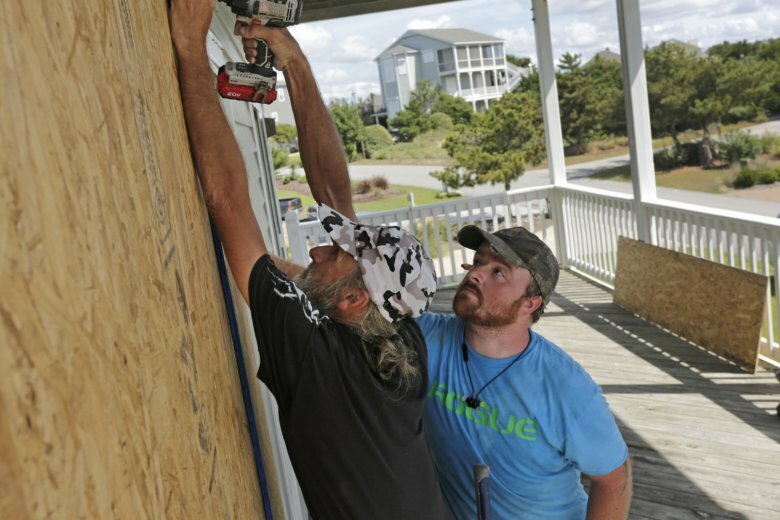 “Our communities count on us in storm prep and then recovery in a very big way,” Smith said. For example, Smith said Home Depot will often provide grants to help pay for hotels or to fill gaps in insurance coverage for damage to an employee’s home. Thayer said Lowe’s has an employee relief fund for such circumstances. “People can request funds to help them if they can’t afford to get back on their feet,” Thayer said. In 2017, Home Depot had revenue of more than $100 billion. Lowe’s earned about $68 billion. Sales of hurricane-related materials spike before and after storms, but the profit is beside the point, Thayer said. “At the end of the day, it’s about the community, it’s about the stores,” she said.